Like millions of other Americans, I’ve vowed that 2015 will be the year I de-clutter. Big time. If I’m not absolutely convinced that an item I own is either useful or beautiful or both, it’s out of here. But because I know that culling out can’t be done in a day, or even a month, I’m employing the “small steps taken one by one” approach. First on the list? Coffee mugs. I’m particular about my mugs. First off, they need to be exactly the right size and shape. Not too big, not too little. Not too short and squatty, not too tall and skinny. Because I like my coffee piping hot, the mugs need to be sturdy enough to keep the coffee warm for the first several sips and microwaveable so that I can nuke it when it cools off. Meaning that metal or plastic mugs are out of the question. And, though I’m probably so old that I needn’t worry about toxic ingredients in Made-in-China dishes, I like for my mugs to be made in the USA. Which pretty much limits my choices to Fiestaware (a West Virginia product) or handmade pottery. I’m embarrassed to admit how many coffee mugs I owned before this cleaning out began. Not counting cups-and-saucers that actually match my nice set of dishes, there were enough mugs to serve more people than could possibly fit in my house at once. It was definitely time to get rid of a whole bunch of them. I started by tossing the mugs that didn’t meet my to-keep criteria, like the bright yellow plastic mugs that, decades ago, came free in sacks of dry dog food. Next, I got rid of two thermal Clinic Bowl mugs from the 1981 state football championship. Into the giveaway box went a pointer-finger-in-the-handle-hole Jacksonville Jaguars mug of unknown origin. A mug adorned with three “Precious Moments” angels. A once-bright red Cookeville Cavaliers mug, now faded to pink from too many trips through the dishwasher. A chipped mug that said YOU CAN’T SCARE ME, I’M A MOM. Another chipped mug that said YOU CAN’T SCARE ME, I’M A TEACHER. A speckled blue enamel mug that was too hot to handle when filled with coffee. Then came the hard part—deciding what to keep. 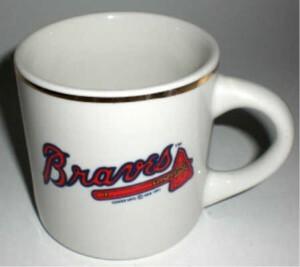 Yes to my one and only Atlanta Braves mug, even though it’s not exactly the right shape. Yes to the mug adorned with three Labrador Retrievers—black, chocolate, and yellow—with red bandanas tied around their necks. Yes to the Great Smoky Mountains National park mug covered with pictures of synchronous fireflies. Yes to the set of four cowboys-riding-bucking-broncos mugs I found at Goodwill. I also chose to keep a really cute Christmas mug decorated with all nine of Santa’s reindeer, two pedestal mugs covered with big red hearts even though I don’t like pedestal mugs, a mug adorned with Elvis in his Las Vegas-era cape and sequined jumpsuit, and—last but not least—a mug that says I’D RATHER BE WATCHING THE ANDY GRIFFITH SHOW. Unfortunately, the bottoms of most of these can’t-let-them-go mugs are stamped “Made in China.” Good thing I’m too old to worry about such things.